Would you like to step into the real Downton Abbey? 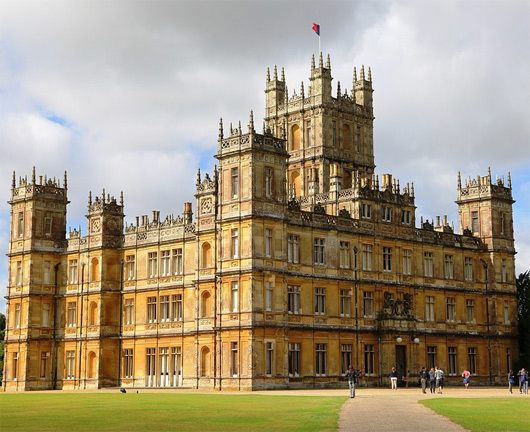 Highclere Castle is a Victorian English manor where the period drama series Downton Abbey is filmed. It is a working estate set in the Hampshire countryside where the Carnarvon family still reside during the winter months and during the summer months it opens its doors to the public. Highclere Castle has been home to the Carnarvon family since 1679. It is built on an ancient site and the original house was recorded in the Domesday Book. The present day Castle was designed in 1842 by the architect Sir Charles Barry, who was also responsible for building the Houses of Parliament in Westminster. Among the rooms you can visit in the house that you will recognise from Downton Abbey are the Great Hall, the Library, Drawing room, Dining room and several of the bedrooms. The Castle is set in 1,000 acres of sweeping parkland which was designed for the 1st Earl of Carnarvon by the famous 18th century landscape gardener Lancelot ‘Capability’ Brown, and is also open to the public at the same times as the house.